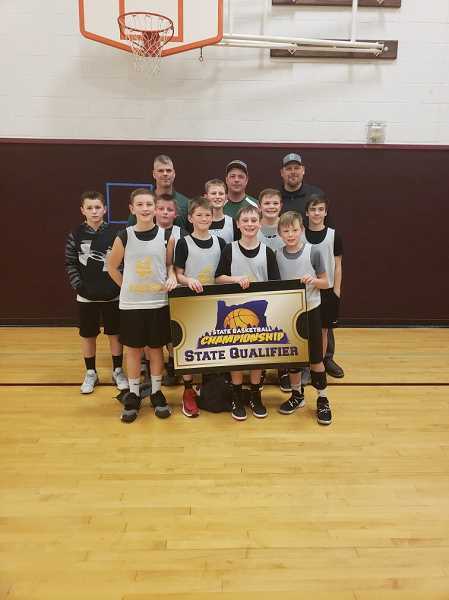 Head coach, Jeremy Roberts, said the returning members of the Colton Vikings Youth Basketball fifth/sixth grade recreational basketball team went undefeated in league play, sometimes scoring 40 points more than the opposing team. Roberts said he and the other coaches decided to step it up. They held tryouts and put together a tournament team. According to Roberts, the first weeks the team played at the higher level they were losing games by 15-20 points. He said the team went into the gym and the players put in the time and effort to improve their basic skills. "Our team has athletes, but not specifically basketball players," Roberts said. "They do multiple sports—baseball, cross-country, fishing and hunting. This team is fast and strong and aggressive, but needed to work on the fundamentals: dribbling, passing, shooting and running plays. "They put their minds to it," he continued, "and have become successful. Defense is our greatest strength." The Colton Viking youth basketball team is playing against much larger schools. At the tournament in mid-January, the Viking team won pool play games against Gladstone and Rex Putman. In the semi-final game, they dominated Clackamas 55-36 before falling to Sandy 42-25 in the finals. The Colton team, having made it to the championship game in a qualifying tourney, received an invitation to compete in the state championship. State will be held in Bend March 8-10.